According to Maria’s Hunting Attire: "Among the first hunters, all students of Gehrman, was the lady hunter Maria. Maria is distantly related to the undead queen, but had great admiration for Gehrman, unaware of his curious mania." 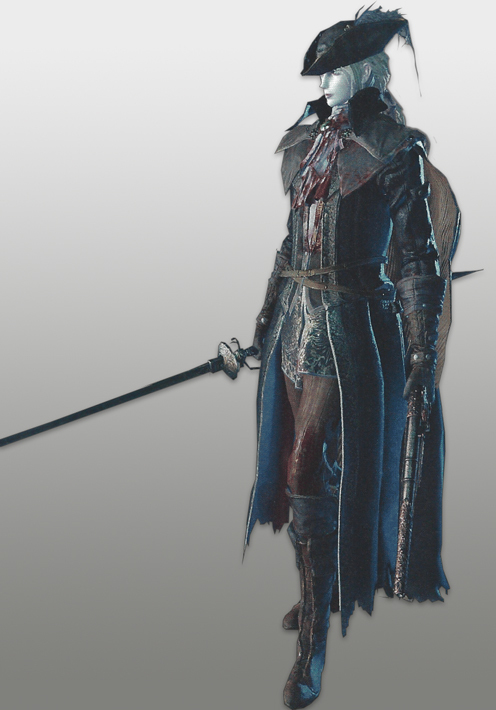 Born in Cainhurst, Maria was a beautiful woman, no doubt even by Cainhurst standards. 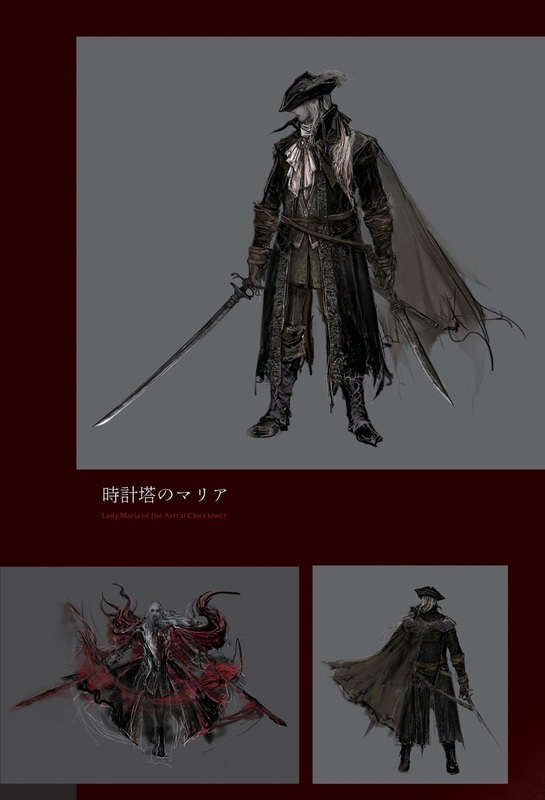 While she was a relative of the Queen, to the aristocratic Nobles of Cainhurst this likely meant very little. Lead Elixirs can be helpful to avoid constantly being knocked out of your attacks as the elixir's effect grants temporary super armor, but some of Maria's heavier swings will still cause you to flinch and stumble so it's generally better to avoid them altogether. High-defense builds with physical damage reduction runes will be able to make the best use of this strategy; otherwise stack two or three Clawmark, Communion or Oedon Writhe runes to boost your offensive capabilities or Blood Vial capacity. Maria is equally susceptible to both lightning and arcane attacks, but is somewhat more resistant to fire; Bolt Paper and the Empty Phantasm Shell will provide respectable increases to the damage of your melee attacks and hunter tools such as the Executioner's Gloves, Tiny Tonitrus, Blacksky Eye and A Call Beyond offer effective ranged options. The Beast Roar is extremely useful for its ability to knock Maria down in a single hit; by alternating it with physical swings at the correct intervals, it is possible to lock Maria in an almost inescapable rhythm of attacks. Maria wields the Rakuyo, a double-sided blade that breaks into a sword and a dagger, and carries an Evelyn pistol. Her fighting style is superficially similar to the hunter NPCs encountered in numerous other locations throughout the game and includes rolls, quicksteps, gunshots and transformation attacks; she is also susceptible to both interrupts by firearms and staggers from charged R2 strikes. Make no mistake, though - she is anything but a generic hunter and in fact uses a multitude of completely unique moves and gimmicks, especially during the second and third phases of the battle. Maria has a permanent Quickening effect identical to that granted by the Hunter Bone and is a highly mobile, evasive and aggressive opponent. She is susceptible to stunlocks during her idle animations but has super armor on most of her combo attacks and individual swings, and from Phase 2 onward she will extend her blades to ridiculous lengths by manipulating her own blood. During Phase 3 her attacks will leave trails of damaging fire and she will begin attempting to stagger you, following up with a visceral attack if she succeeds. Phase 1: During Phase 1 you may either quickstep forward past Maria's attacks and strike from behind with melee combos during her recovery or simply bait and interrupt her swings. Gunshots and projectiles are largely useless at long range as she will usually dodge them, but skirting just out of reach of her attacks and tempting her to take a swing will force her to commit to an attack animation and provide you with an opportunity to interrupt her. Phase 2 & 3: During Phase 2 and 3 it is no longer safe merely to quickstep forward through her attacks as the extended reach of her blades and the trails of fire left by her attacks will often strike behind her or in 360-degree radius; you'll still need to use the evasive components of this tactic to avoid her forward combos, but the most reliable ways to damage her remain baiting opportunities for interrupts or knocking her down with the Beast Roar. The boss room is a rectangular chamber with a narrow set of steps leading up to a small mausoleum at the far end. Like most other arenas of this shape, the main danger is becoming trapped in the corners or against the pilasters lining the walls; you must also be careful not to let Maria back you up to the steps as there is no avenue of escape from atop the mausoleum other than directly past her. In general, keep the fight to the center of the room as much as possible and lure Maria away from the walls or corners if necessary; however, bear in mind that if using specific strategies such as trapping her in an infinite combo with the Beast Roar, backing her into a corner or against a wall can actually work to your advantage and help prevent her from escaping. 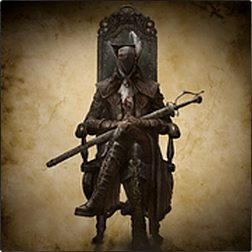 Despite Lady Maria having 999 Slow Poison & Rapid Poison resistances she is still vulnerable to such status. Defeating her will open unique dialogue from the Doll. Dialogue: "Good hunter. This may sound strange, but... Have I somehow changed? Moments ago, from some place, perhaps deep within, I sensed a liberation from heavy shackles. 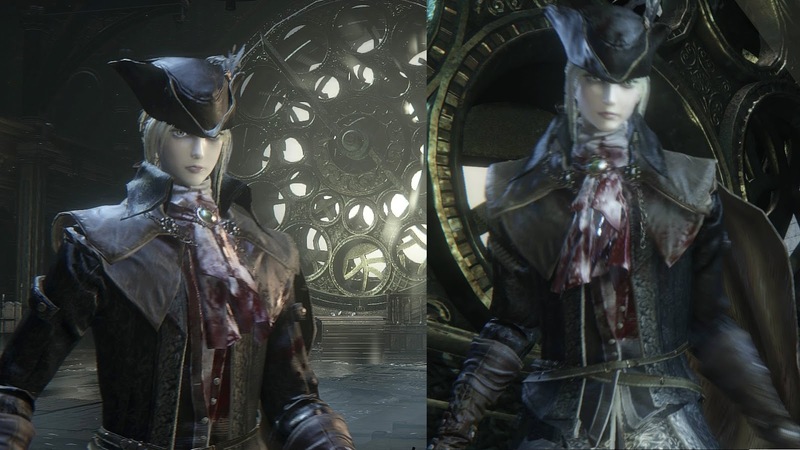 Not that I would know... How passing strange..."
Lady Maria is voice acted by Evetta Muradasilova who also voiced Doll and Maiden in Black from Demon's Souls. Iai Blow Yes Extremely fast long-range strike with a delayed startup and strong lateral tracking. Quickstep forward past it just before she strikes or interrupt it by timing your shot so that the bullet connects as she begins the dash. Launcher Combo Yes Quick two-hit combo that will launch you into the air, sometimes used as part of longer combos. Interrupt her or quickstep forward past the swings. Double Overhead Slash Yes Heavy slash with a slightly delayed startup and super armor, used on its own and in combos. Interrupt it or quickstep forward past it and continue strafing sideways in the same direction to avoid subsequent swings. Double Lateral Slash Yes Heavy horizontal slash with both blades. Quickstep forward through it or sideways in the opposite direction of the swing, or interrupt it. Cross Slash Yes Lunging scissor-type cross slash. Quickstep forward past it or interrupt her. Transformation Attacks Yes Used periodically to switch between weapon modes. Interrupt her or quickstep forward past both versions of the attack. Phase 1 Strategy: During this phase Maria will walk slowly toward you and begin launching attacks when she reaches mid range. Exploit this behavior to anticipate when she will strike and either interrupt her or quickstep forward through her swings and counterattack from behind. Some of Maria's delayed attacks such as her double slashes and lai Blow leave enough time to interrupt them on reaction; it is also possible to set her up for an interrupt by baiting her to begin a combo, dodging the first hit and shooting her when she begins the second. Attacking Maria in the middle of one of her combos is strongly discouraged as there is a risk of hitting her while her super armor is in effect and becoming trapped in the rest of the combo when she absorbs the hit. Never attempt to dodge by backing up if you are anywhere inside mid range as almost all of Maria's attacks carry her forward by at least the length of a quickstep. Dodging diagonally forward past her will avoid nearly all her attacks during this phase, though the timing will be slightly delayed for her heavier swings. 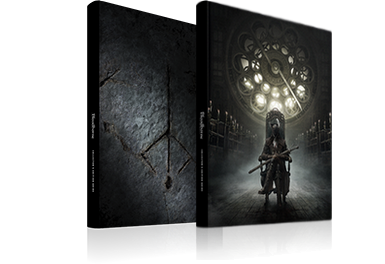 Maria is susceptible to stunlocks during her idle and walking animations, and can be trapped in combos with heavy weapons such as the transformed Kirkhammer and Ludwig's Holy Blade if the first hit causes her to flinch. She is especially vulnerable to being stunlocked after finishing a combo but will sometimes backstep away and escape after one or two hits; at this point she will usually initiate an immediate and fairly predictable melee counterattack, opening herself up to an interrupt. Beware that Maria also has super armor during her recovery from being knocked down and if she is flattened with the first hit of a Kirkhammer charge combo, the followup swing will NOT send her flying if it connects and will instead leave you open to a counterattack. Faster weapons such as the Kirkhammer's longsword and the transformed Blades of Mercy ARE effective for stunlocking Maria as she recovers from being knocked down; this can be used to set her up for extremely long combos such as a visceral attack followed by an R1 chain as she regains her footing. She'll usually be focused on attempting to counterattack at this point, so she will often not bother trying to quickstep out of the combo. Be sure you conserve enough stamina to quickstep forward past her after the last hit of the R1 chain, though, as fully depleting your reserves will give her an opening to counterattack. Reduce Maria's health to just above 60%, then interrupt her and perform a visceral attack (and ideally an R1 combo as she stands up) to minimize the amount of time you'll have to spend fighting her far more dangerous Phase 2 attacks. Dive Bomb No Leaps high in the air, pauses and performs a forward dive at a fixed angle. Tracks laterally and creates an explosion when she lands; quickstep forward underneath her at shorter range and backward at mid range. Blood Burst Yes Raises the blade above her head and performs a small frontal short- to mid-range area attack with a slightly delayed startup marked by blue particle effects. Interrupt it or quickstep forward past her just before she strikes. Blood Stinger Yes Lowers the blade to her side and performs a mid- to long-range diagonal slash attack with a delayed startup marked by blue particle effects, sometimes followed by a second identical slash. Quickstep sideways one to two times just before she strikes. Blood Lance Yes Levels the blade at her shoulder and performs a heavily-delayed long-range thrust attack in a straight line; the windup is marked by blue particle effects and she'll sometimes immediately follow up with a wide horizontal slash with the same reach. Quickstep sideways just before the first attack and either sideways through the second at a distance or forward past it at close range. Phase 2 Strategy: When Maria's HP drops below 60% she will use a spherical area attack in which she impales herself with her blades, causing a small explosion centered on herself. She has infinite super armor and cannot be staggered during this attack; at this point the length of her weapons will increase drastically and she will begin using her Phase 2 moves in addition to those from Phase 1. Bear in mind that while the animations for her Phase 1 attacks are still the same, these swings can now reach you from much greater distances due to the increased length of her blades. The safest opportunities to use Blood Vials are largely limited to the recovery periods of her slower moves and while standing behind her after quickstepping forward through one of her combos; do not under any circumstances attempt to heal yourself while standing in front of her unless she is very far away from you and even then, keep a close eye on her to be sure she isn't about to hit you with a Blood Lance. Interrupts are riskier during this phase due to the increased range of Maria's attacks, but are still the best way to finish her quickly. Baiting her melee combos at mid range (leaving enough room to quickstep backward away from the first attack and calculate the timing of a gunshot to interrupt a subsequent swing) is the most reliable means of dealing damage. She can still be stunlocked with melee combos, but will counterattack more aggressively if she escapes. Reduce her health to just above 30% and interrupt one of her swings, then hit her with a visceral attack and an R1 combo as she stands up in order to help end Phase 3 as quickly as possible. Flying Cross Yes Resembles the Cross Slash but with a delayed startup and fairly obvious telegraph. This move will instantly stagger you and if it connects, Maria will immediately attempt a visceral attack. Can be interrupted from a safe distance; otherwise quickstep forward past it. Phase 3 Strategy: When Maria's HP drops below 30%, she will run away from you and float into the air for a few seconds, then generate a large AoE explosion around herself and power up her swords. She can be attacked during this move but it has infinite super armor and she is immune to staggering for its duration. The AoE lingers just long enough that the quickstep's invincibility frames cannot be used to dash through it; if you decide to attack Marla during this time, quickstep backward twice when the sound of swirling blood begins to fade. Maria will continue using all of her previous attacks during this phase, but their range will increase even further and they will now leave lingering trails of flame which will damage you on contact. The radii of her area attacks such as the Blood Burst increase substantially at this point and she will begin using a slower version of her Cross Slash to stagger you, following up immediately with a visceral attack if it connects. Attempting to bait interrupts from the front is now extremely risky; quickstepping forward past her swings and counterattacking from behind is still fairly reliable, but it is almost impossible to avoid taking damage from the trails of fire. Lead Elixirs will prevent flinching due to residual fire damage, but direct hits with Maria's blades will still cause heavy hitstun. Make every effort to end the battle quickly when this phase begins - taking too much time greatly increases the risk of being clipped and killed by a stray slash from across the arena.